Phuket is Thailands largest island and oldest holiday resort. On the West coast of Thailand in the Andaman sea and just North of Malaysia it is also a perfect stepping stone for the whole of South East Asia. 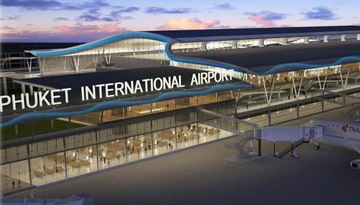 With more and more airlines adding Phuket to their route list, seasonal direct charter flights and ever increasing capacity it is very easy to get a cheap flight to Phuket. The main resorts of Patong, Karon and Kata stretch south from the airport connected by a long sandy beach, the further you travel from the airport the quitter the resorts get until you reach the southernmost point of Cape Panwa. To the north of the island on the mainland via the bridge you will find the resort of Khao Lak, still a relatively undiscovered part of Thailand but becoming more and more popular with less nightlife and clubs and more bars and restaurants. Take full advantage of the jungle on your doorstep here and visit the elephant sanctuary, a retirement home for working elephants, or for those who love the sea there are some great dive spots to be discovered off the Similan Islands. On the west coast of Phuket is the main ferry port from where you can hop over to one of the many islands or span across the bay over to Krabi. The party island of Phi Phi made famous by the film “The Beach” is a big draw to the younger crowds, with its full on all night beach parties. All in all Phuket has something for everyone and has been offering it for decades, it is also a very popular retirement spot, so don’t be surprised if you fall in love with the place and decide to stay. 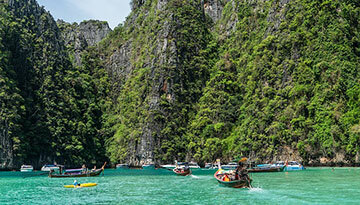 Best Emirates flights to Phuket from Heathrow with return economy class fares at £579*. 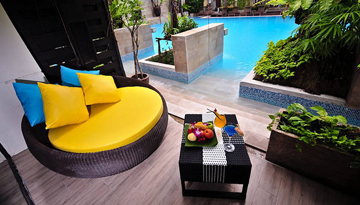 Fly from Heathrow - Phuket & Stay for 7 nights with 4 star accommodation. Room only.